Venus: For a Limited Time Only! It’s with a sense of urgency that I bring you Venus, a special style created by the folks at Alli&Ali Designs Mainstore for SL’s Renaissance Faire VIII. It’s only available until the end of September, and you can find it at the faire site…but there’s a catch! Teleporting to the site won’t bring you directly to the style. Once you’re there, you’ll need to TP to the entertainment arena (Busking Stage). From there, you’re on your own. I’d give you better directions, but you really need to spend some time exploring everything the Faire has to offer. The Big Deal, indeed, is a style you won’t find anywhere else—or even for very long. As usual, the complete set, with all the colors you see here, sells for $L1500, but during the Fair, you can buy subsets (browns, blondes, reds, greyscale, etc.) for only $L250 each. But you have to act quickly, because once the Faire is over, so is this style. 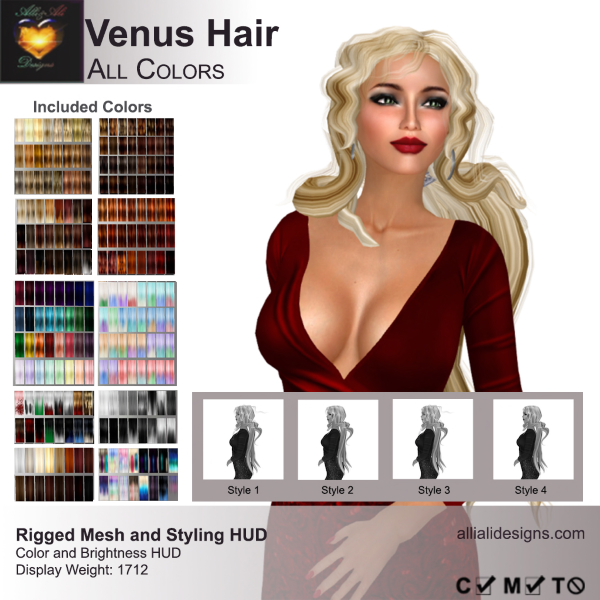 Venus by Alli&Ali Designs Mainstore. Only at the Renaissance Faire. Next postHurry! Get ‘em While You Can!